Bicycle theft is rampant in many urban neighborhoods, and Chicago certainly has its share of the problem. Whether you are riding an premium bike or a garage-sale model, having your bike stolen is expensive, inconvenient and downright maddening. Fortunately, there are several things you can do to make your bicycle a less likely target. Know the difference between locks. Any lock can be broken given sufficient time and the right tools. However, there is definitely a difference between weak locks and strong locks. Don't rely on a simple cable or chain and padlock to secure your bike. Those types of locks can be snapped with rather simple tools, and are useful only as auxiliary means for securing wheels or accessories on your bike. If you leave your bike unattended anywhere, make sure you have a quality U-lock, other high security lock such as a hardened chain or folding lock. There are many types of bicycle locks, offering different levels of security. People often ask for a bicycle lock by brand, but lock quality, not brand name, is the more important consideration. A $30-40 U-lock, regardless of brand name, is an entry-level lock. If used correctly, it provides a moderate level of security, and is suitable for less expensive bicycles, or situations where security is not a major concern (such as when you go out to eat, and can see your bike through the window). Entry-level Kryptolok with cable from Kryptonite. High-security Bordo Granit from Abus. Wheel locking skewer set from Pinhead. More premium $90-100+ locks are well worth the extra expense. They are made of a higher grade of steel, and designed to foil the most common lock-breaking methods. They are quite very difficult to break even with special tools (we know, because we are sometimes called on to do it when the bike owner has lost his or her keys). Such locks are a good choice for more expensive bicycles, or for any bike that gets left out for prolonged periods, where the owner cannot see it. 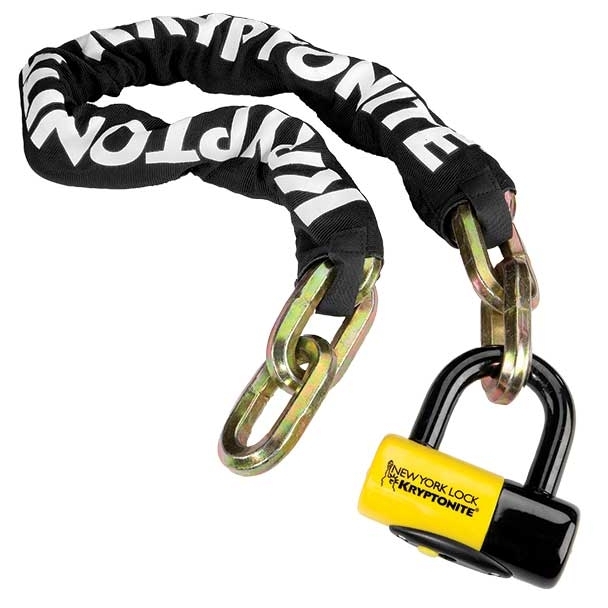 Alternatives to U-locks, such as Kryptonite Chain locks and Abus Bordo series are also available in different levels of security. They work well on hard to lock bicycles, such as recumbents or full-suspension mountain bikes. Bordo folding locks offer the additional advantage of being easy to fold and store when not in use. Learn to lock you bicycle properly. Most bikes are stolen not because of a broken lock, but because the bicycle was locked improperly or not at all. Enjoy these vintage drawings by Justyna, ca. 1994? Lock your bicycle each and every time you leave it unattended, even for a short time. Remember that your bicycle is not only a desirable object commanding a resale price, but also a getaway vehicle for the thief. In the time is takes you to, say run into Starbucks for an iced latte, the thief could be a block away on your bicycle. Select a solid object to lock it to. A city bike rack or a parking meter (where available) work well. If you are using a chain-type lock, make sure it is wrapped tightly enough so it won't slip over the top of the meter. Avoid chain link fences, wooden porch supports, thin trees, or anything that looks like it can be cut. Street signs are a poor choice as well, since they can be unbolted and pulled out of the ground. Secure the frame and both wheels of your bicycle, even if you don't have quick-release wheels. Many people lock the frame and the front wheel, assuming that the rear wheel is harder to remove. Not true. Rear wheels are stolen more often than the front, simply because they are not locked. On a basic multi-speed bicycle, a front wheel may cost $100-120 (plus labor) to replace, but a rear wheel will cost at least $60-100 more, first, because rear wheels are a bit more expensive to start wth, and because you will also have to replace the cassette (the set of cogs) as well. For bikes with more premium equipment, replacement cost can run considerably higher. We recommend that you get a good quality U-lock (or equivalent), big enough to go around the rear part of your bicycle and the back wheel. If you have a quick-release front wheel, remove it and secure it together with the back part of your bike. If you have a bolt-on front wheel, or if you prefer not to remove your wheel every time, put a cable through the front wheel and loop the ends through the U-lock. (Shown in sketches above.) Yes, a cable can be cut, but it is less likely that a thief will go through the trouble just for the wheel, especially if a bicycle next to yours has an unsecured front wheel. Some people opt for two U-locks, which can be cumbersome, but is quite secure. As an alternative to the above, use a small-shackle U-lock, which is about the size of your hand, and purchase a set of lockable wheels skewers to replace the quick-release ones (see photo above right). This option is quite expensive (120-150+ for the lock and security skewers), but it is very convenient and time-saving, as it allows you to carry a very compact lock, and simply lock your frame. Whatever locking system you choose, never lock your bike by just the wheel, handlebars, seat post, or any other part that can be cut or removed. And never, ever buy any bicycle which you suspect to be stolen. Nothing encourages thieves more than knowing there is a market for their goods.